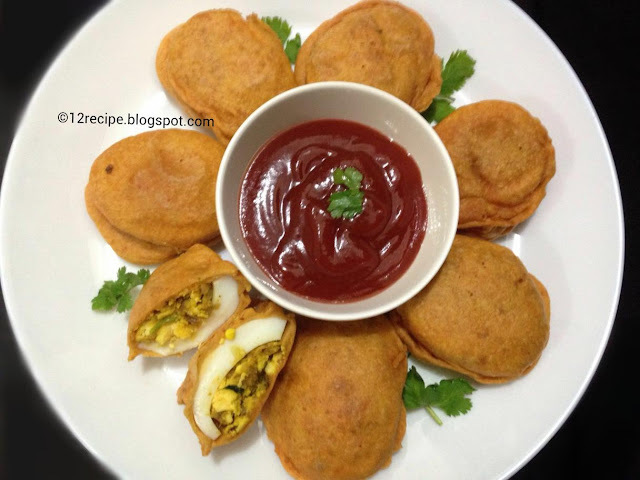 Stuffed egg bajji / Egg pakora is one of my all time favorite tea time snack. The crispy and tasty tea time snack goes well with a cup of tea. 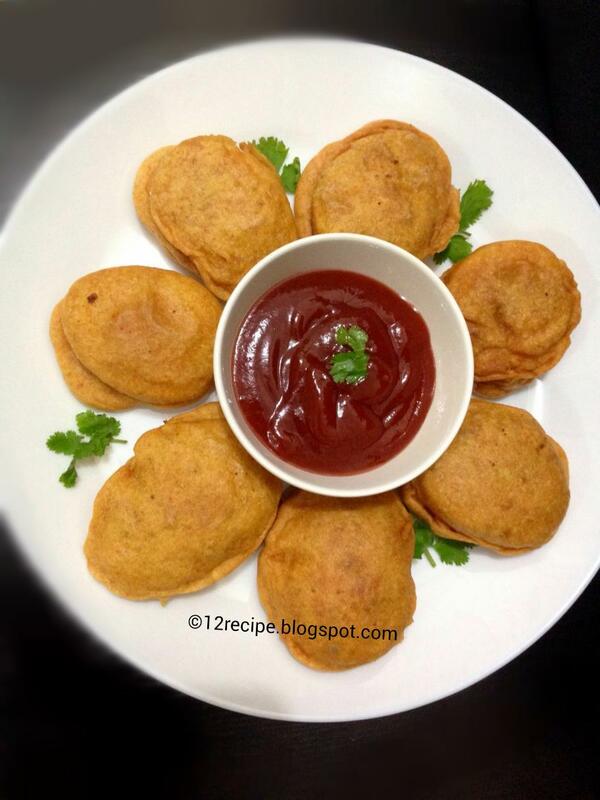 Normally egg bajji is prepared by directly add the cut slices off egg in to batter and then deep fry it; But here the egg is filled with a onion-egg yolk masala and then dip in to the batter. Start making this quick snack and serve hot. Cut the boiled eggs in to two length wise pieces. Remove the egg yolk from it and mince it in to powdered form. Heat a tablespoon of oil in a pan; add thinly chopped onions and saute until transparent. Add ginger and garlic crushed. Saute for a minute. Add turmeric powder, chilly powder, pepper powder and salt. Add coriander leaves chopped and minced egg yolk. Mix well and switch off the flame and let it cools down. 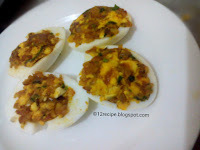 Take small portion of the prepared masala and fill it inside the egg yolks position. In this way fill the remaining eggs with prepared onion-egg yolk masala. Now make a thicker batter with besan flour, rice flour, turmeric powder, chilly powder and salt. Carefully drop an egg piece in to batter, in such a way that the filled portion upwards. With a spoon cover the egg with coating and add in to the hot oil. Deep fry it on hot oil in low flame until both sides are golden in color and cooked well. Drain in to paper towels and serve hot with tomato ketchup. Add a pinch asafoetida (hing) to the besan batter; if you want to enhance the taste. The oil must be very hot at the time of adding egg; and then fry it on low flame; otherwise the inner side didn’t cooked well. Deep frying is important. If the oil is not fully covered the egg bajji; then add hot oil on top with a spoon at the time of adding the Bajji's in to oil. Take care to do not stick each of the bajji’s together when adding in to oil.